Mr. Ben Barber was born in the family home north of Hughes Springs, Texas, on July 7, 1909. He was the sixth child of Ellie Cannon and Bradley Barber. He attended Center Point School near his home through ninth grade. Mr. Barber received his high school diploma at the East Texas Teachers College, and went on to attend Texas Agriculture and Mechanical College. He taught and worked at the college, and graduated in 1935. In 1935 he became the first vocational agriculture teacher in Mansfield ISD, and taught in the district for thirty-five years. During Mr. Barber's first year of teaching he met Doris Blessing, who lived next door. They were married August 15, 1936. Mrs. Barber taught in the Mansfield ISD for 20 years. During his long career Mr. Barber taught many students. He always referred to them as "his boys," long after they graduated. Ben Barber was the first advisor for the Mansfield Future Farmers Association chapter, where he coached many teams to district and state championships. 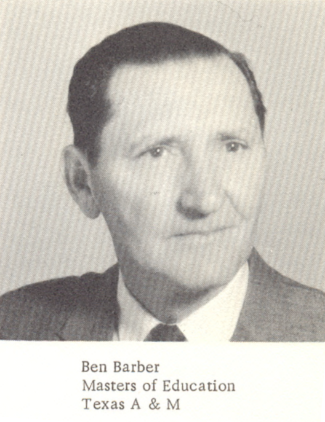 Mr. Barber retired in 1970, and in 1975 the community honored him with the naming of the Ben Barber Career Center. Mr. Barber died in 1997.